A quick, easy & healthy lunch or dinner! 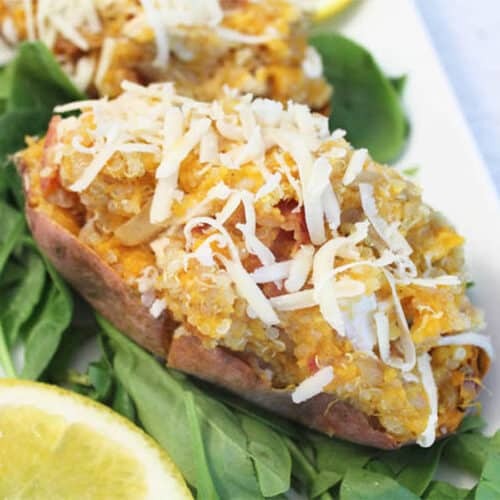 Just cook up a sweet potato & stuff with a mixture of quinoa, turkey & bacon, flavor with maple syrup and voila - quinoa stuffed sweet potatoes! Cook sweet potato by poking holes in the skin with a fork or sharp knife then placing on paper towel in microwave. Heat on high for about 6 minutes for a 1200 watt oven or until tender. You can also cook in the oven at 350 for 45-50 minutes. While sweet potato is cooking, place quinoa and broth or water in small saucepan and heat to boiling, turn down, cover and simmer for 15 minutes. Cook bacon until crisp. Remove to paper towel to drain. Add onions, apples and nutmeg to bacon grease and cook until onion is tender, about 5 minutes. Remove sweet potato from oven and cut in half lengthwise. Scoop out contents and place in medium sized bowl. Be careful not to tear skin as you are going to use it as a bowl. Mash sweet potatoes. To mashed sweet potatoes, add maple syrup and salt & pepper to taste. Pour in quinoa, crumbled bacon, onion-apple mixture and turkey, if using. Stir well. Divide mixture between the 2 sweet potato halves. Sprinkle with cheese. You can either serve as is or place under the broiler to brown and melt the cheese.